Considered one of the five most dangerous sharks in the world, the oceanic whitetip shark has a stocky build, a short, bluntly-rounded snout, and incredibly powerful jaws. This voracious predator grips its prey with the pointed teeth of the lower jaw, serrated only at the tip, while the broader, triangular, serrated teeth in the upper jaw are used to saw, cut and tear the flesh. The first dorsal fin is distinctively large and rounded, and the paddle-like pectoral fins are very long and wide. 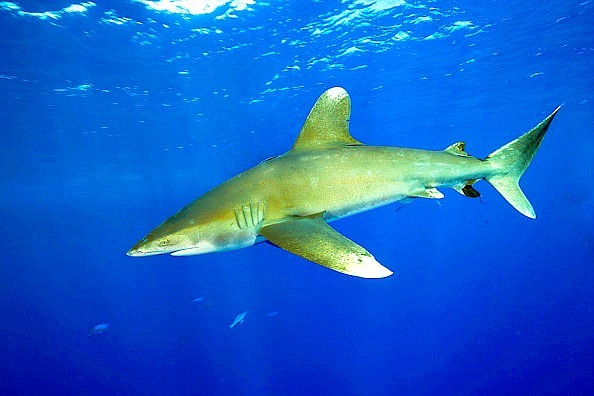 The oceanic whitetip shark is so named because the tips of its pectoral, first dorsal, pelvic, and caudal fins are often white or show white mottling. These markings are usually black on young individuals below 1.3 meters, and a dark, saddle-shaped marking may also be present between the first and second dorsal fin. Depending upon geographic location, the body colour may be brown, grey, beige or bronze, sometimes bluish, while the stomach is usually white, occasionally with a yellow tinge.